A lymphatic system diagram shows that the human lymphatic system is connected to every organ of the body. It interacts with every organ and is directly related to immune function and efficiency. It is a protector and a defense mechanism against infection, viruses, bacteria, fungi and disease. It is comprised of fluid, vessels, ducts and various other organs and structures. It clears toxins, wastes, excess fluids, and infection from all tissues of the body through proper flow and drainage - provided this essential system is functioning at its peak. You can see in the lymphatic system diagram to the right (and there is much detail that you can't see) that it extends throughout the body. Diagrams further down the page will show how to greatly increase the movement of the lymphatic fluid. Mention the heart or the cardiovascular system and most people have a pretty good idea of what it is and how it functions. But, although the lymphatic system is vitally important to our health, most people don't understand it. Some have not even heard of it. The cardiovascular system delivers life-giving oxygen and nutrients to all of the organs and cells of the body and is connected to a very strong blood pump - the heart. The lymphatic system is also connected to every organ of the body, but its function is completely different from that of the cardiovascular system. It is the garbage collector, the internal vacuum cleaner sucking up metabolic garbage, toxins and excess fluid from the extracellular fluid of every organ. If this flow is impaired, the fluid becomes thick and toxic. The parts of the body that rely on it for elimination become less efficient and sluggish as they fill with their own waste. This otherwise life-sustaining system now becomes a breeding ground for infection. When the fluid enters the bloodstream, as is part of the normal process, infection can now spread to any organ or part of the body. Many viruses, bacteria and parasites stay locked within the lymphatic system when these conditions are present. The result: physical ailments, degenerative disease, hastening of the aging process, even death! If you could see this same lymphatic system diagram realistically portraying the condition of a serious infection, you would see swollen lymph glands in many places. The lymphatic system is not connected to the heart, so it has to rely upon some other activity to create the necessary pumping action it needs to circulate. The three most important methods of lymphatic circulation are external massage, muscle activity, and vigorous exercise. The lymphatic system is filled with millions of one-way valves, which allows lymph fluid to flow unidirectionally - usually upward away from gravity. Almost anything that can stimulate the movement of lymph fluid inside the lymph vessels of the system is healthy, but the most efficient way to stimulate the flow of lymph fluid is by rebounding. The up and down rhythmic bouncing causes all of the one-way valves to open and close simultaneously increasing lymph flow as much as fifteen times! Rebounding does that. An emunctory is any opening through which the body eliminates foreign matter from one part of the body to another. This is not only through the eliminative organs, such as the bowel, kidney or lung, as most would think, but also can be via a joint, lymph system, or skin, for example. When a foreign substance is present, the body's first reflex is to expel or eliminate it. When this elimination is suppressed by any means such as by taking traditional drugs, medications or some therapies, some of the foreign matter gets suppressed (or pushed back into the system). Then, the very organisms or substances the body is intelligently attempting to eliminate become stored within the body and in any number of areas causing any number of disease symptoms. As this process occurs and elimination is blocked, the body then becomes toxic. When the toxins cannot be removed due to congestion or blockages, the degenerative disease process begins. So, if you want to get your lymphatic system really moving the best way is by rebounding. Here is why it works so well. This lymphatic system diagram shows that on the way down the lymph will be moving upwards because of the decreased pressure in the one-way valves. When you reach the bottom of the bounce you and your lymphatic vessels stop moving but, of course, the lymph, being a fluid, has some inertia and wants to keep going down. 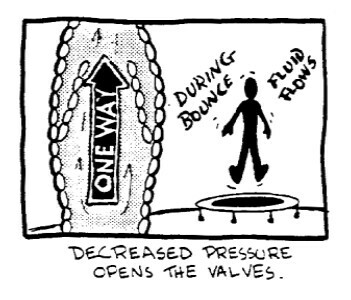 Its downward pressure on the valves closes them and keeps them closed until the body starts to decelerate towards the top of the bounce. The next lymphatic system diagram shows the one-way valve closed at the bottom of the bounce. 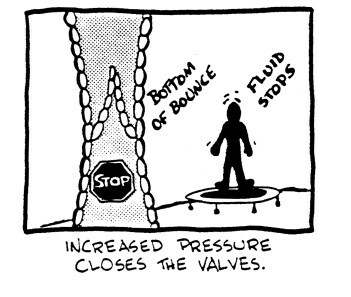 The fluid will press against the one-way valve causing it to stay closed until about the top of the bounce at which point the inertia of the fluid will keep it moving upward and will hold the valve open. While it is open - and millions of other valves are open at the same time because they are moving with you as your whole body bounces - the lymph is flowing at an accelerated rate and you are getting a good lymphatic flush. Here is a short video explaining more about the function of the lymphatic system.